Family Story Time is designed for all ages. We explore a theme and work on our fine motor skills while we sing songs, play games, make crafts and read stories. This program usually last an hour. Family Story Time meets every Wednesday at 10:00am. The program is repeated at 6:30pm. The program will begin on September 18, 2013, and run until May 15, 2014. 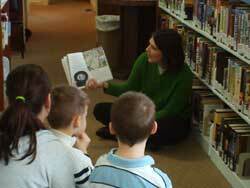 Each summer the library host activities for 3-5 year olds, Kindergarten-5th graders and for 6th graders-8th graders. Weekly programs are held to correspond with the reading theme. In addition to the weekly programs, children are encouraged to read for the fun of it. Our hope is to encourage reading to be a life-long activity. Children fill out reading logs signed by their parents and are returned for prizes. Registration for this event takes place the first week of June. Programs begin the middle of June and run through July. The program ends with a party where additional prizes are given out. The 2014 theme is "Paws to Read". The birthday club is a special program that honors children on their birthdays. For a fee of $15 (the average cost of a children's book), the library will purchase a book that matches the interests of the birthday child. A special birthday sticker with the child's name will be placed inside the book and the child will get to be the first person to check the book out. A birthday card will be sent to the child wishing them a happy birthday and explaining the program to them. In addition, years later, when the time comes to remove the book from the collection, the library will attempt to contact the child (now a teenager or adult!) to see if he or she would like the book as a remembrance. Each fall the library host a reading program to encourage adults to read. Adults receive a reading log and are asked to keep track for the books they read. Each week the log is turned into the circulation desk and raffle tickets are awarded for each book read. Then on Tuesday during our Coffee Hour Program a name is drawn and that adult receives a gift card to a local business. Registration for this event takes place the first week in September and the program runs until the middle of November. Each Tuesday at 10:00am the library hosts coffee hour. Fresh coffee and pastries are served, as well as, new books added to the collection are highlighted. Join us for interesting conversation and new books.